1. take your dog to a city center, a store that allows dogs (pet store?) and on a train station. Do some easy tricks and tape your tricks in a new environment this time. 2. position yourself next to a high target and now only click for circling all the way to your leg (don't click for steps in between) - name it with heel for one side and something else for the other and have a dog follow your leg when you move in a circle around the target away from the dog - then tell him to come to the other side and have him follow the other leg. Use different targets, try it on a very low one too. A word of warning: when you position yourself next to the target, you need to stay at it's side, NOT behind it (so at 3 or 9 o'clock, not 6! ), meaning that you need to move from one side to another every time you ask the dog to come to the other side. If you stand behind the target, you're practising wrong position as the dog is too much in front. The dog's paws should be were your heels are, his shoulder at your knee and his rear end completely straight - parallel to you. 4. try the other version of 2on2off: instead of having them go on an object and off, stop in a position and wait, let's try stepping back into 2on2off this time. Position your dog close to a low object behind his back (maybe just a folded blanket or a low pillow first! ), cue him "back" and reward for stepping on an object or trying to. Slowly, you can have a dog step on higher&higher objects - this is beginning of a handstand, but with young puppies, don't overdo the height. Instead, you can have them back up stairs or cavaletti for example, to challenge them some more without making it too physically demanding. You need to build balance and strength slowly enough for the dog to never be sore after. You can also teach them a "pee" trick: click when they heave one leg, searching the object - before they find it and name it, it's a fun one. 5. put your paw target on a drawer or doors or simply shape the paw touch to a drawers/doors and then select for stronger&stronger touches/pushes. The goal is to have the dog slam the doors or a drawer with power, to teach them that they control the movement under their feet and the sound and that it's FUN - my favourite trick for a great see-saw! 6. don't forget on recalls and playing!!! Also, slowly add duration to a sit up, teach crossing paws with the other paw and fade the target and check if the puppy will stay in 2on2off position until "go" even with distractions (toys and food flying around) - we'll need that for next lesson! See you back in class on 26th November! I posted this one because she really does love the “bang” trick and because it shows perfectly HOW her mind works and how she learns things. And how excited she gets doing her tricks! That first push was sure brilliant! Somewhat too strong for her for now though as she was not so sure about it after that… So a lower see-saw would actually be better, so that you can get more of those powerful pushes without her getting uncomfortable about it. For a small dog, that’s quite some height already, so I would definitely go lower -- there is never too much confidence! Finally caught one of her “sit pretty” sessions. Mostly I don’t have a camera even close when we practice this one! We are going very, very slowly with all the balance and stretching tricks. She has a very real difficulty doing the frog. I can only get her to do it by asking her to crawl under my leg, and she’ll only do it once or twice before she really wants to quit. She has just as much trouble doing “foot” when she is lying down -- she can barely move either front paw in that position. And “four paws in” is also quite difficult for her. I think she is just a very stiff little puppy! So we work on all these tricks -- but only in very, very short sessions — not expecting much at all. Meanwhile, I am clicking her for any kind of stretch she does -- play bows, stretching a rear leg out behind her -- and starting to work on some manual stretches and “cookie stretches”. Funnily enough, she is very good at balancing on her hind legs, and loves to do her 2o2o! It’s also true that we didn’t work very hard this last week. We got the speed video and watched the first five minutes. The weather was beautiful, so we skipped video watching and trick training, and went outside for a long, long hike with her best friend Gracie Rat Terrier instead! 🙂 The weather stayed beautiful all week and we stayed outside as much as we could. Love the video! Glad you liked the video! 🙂 And yes, those exercises are definitely much harder for some dogs as others, so it’s better to not do too many repetitions and keep it easy and fun -- I’m sure you’ll get there! Stiffness actually goes together with good duration on standing on hind legs and also with standing on front legs, so your observations are definitely right. To make a sit up easier for her, I would let her lean on your hand, as she does two times in this video and just reward that several times, to add duration to it. Keep hands low, so that she doesn’t stand up and keep rewarding as long as she is in the wanted duration. -- And then just tell her to sit again and offer your hand as a support. Thanks! We’ll keep working on it. this is our last training, Second session for slamming the door, Astro likes that trick 🙂 circling to my leg is the most dificult for him, first tries were with only with a book, but he got frustared and he bacame to bark and bark… so I used 2 books again, then backing up, I´m clicking for two legs on or one leg up, is it rigth? shold I name each behavior now? That’s a really nice, powerful slamming! Not sure why he finds pivoting so frustrating, I think he was doing really well when we were just having them circle it? Definitely use higher target for now if it helps, until he starts to understand the point more. Also, try to reward with even higher head. Very nice 2on2off too! And yes, you can reward both, one or two legs -- and do name it soon! 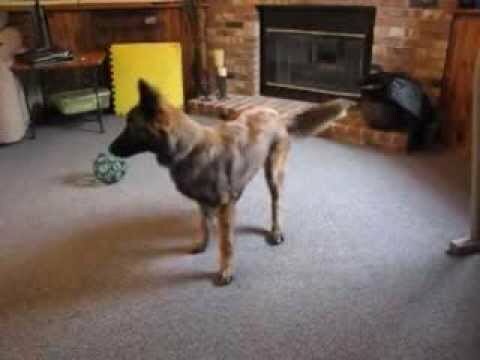 Here’s a video of our first try of Papu circling to my leg. And a short video of backing on cushions (sorry, camera was a bit too close). Wow, great pivoting to your left leg, really nice position, maybe you can only try to reward even higher, with a straight and vertical head. But first do some more work on right side, maybe only work on the right side for a couple of sessions. Very cool backing up the object too! Time to master a pee trick too and then continue towards handstand! You can post an update on a sit up too, to see where you are now. A new video from us. We couldn’t train so much in the last weeks. Here our training status from a few tricks. Very nice position with pivoting, but do some more work on a target to get more of a “glued to the leg” effect before trying to fade the target. VERY cute leg crossing and sit up -- what a great duration and I just love the waving legs! 🙂 -- Challenges her balance even more! 🙂 Nice backing up too, keep adding duration -- and name it too if you didn’t yet! Ok here is my video I am training everything but very behind on video! thanks again! Great to see Lava again! She is sure progressing nicely, very cool paw crossing and backing up and impressive almost-handstand. Reward it lower, ideally on the floor though, to keep the head low. Nice pivoting too, just try to help a little bit less with your hands, it will help with fluency. Reward very high, with a vertical head. For a sit up, keep the target pretty low so that she doesn’t stand up and more towards her, so that she is more vertical and can balance better. Wow, that’s a very nice sit up already! I knew he will be really good at this once he gets the idea! And well, sometimes luring is the easiest way to the goal 🙂 I do avoid it with puppies who are still learning shaping, but once they get the concept and learn to think, I have no problem with luring something as simple as a sit up, it works perfectly well especially with dogs who already learned to think even with treats right in front of their nose.